Keep your retail or home windows clean with the help of London Cleaner! Window cleaning in London can be quite a tiresome chore for anyone. Windows tend to get dirty on the outside fairly quickly. This is due to a mixture of dirt, dust and the pollutants they get exposed to. It can also be a dangerous one, if the windows are at a place higher than the ground floor. Climbing on tall ladders with a bucket full of water and detergent can be hazardous. 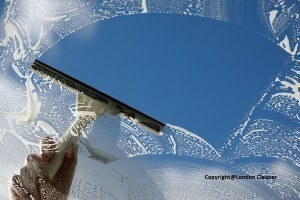 Moreover, without professional equipment, window cleaning London can also look tougher than it is. It is therefore recommended to leave it to the professionals. Our window cleaners have all the right equipment and safety measures to make your window sparkling clean. Many cleaning companies offer window cleaning as a service. Many others companies are solely dedicated not to clean windows. London Cleaner cleaning company provides a service that ensures your windows are left sparkling clean. Our window cleaners are very well trained and fully equipped. This service is available to both homes & offices. Our window cleaning prices – the minimum charge is £60.00 + VAT. We offer very low rates. For windows above second-floor level, we offer our services on a contractual basis on request. Please contact our office for more information on 020 8884 9142 or click here to book.